« The Best Bicenterary of 2012? I noted last weekend that The Sugar Girls had deservedly made the Sunday Times top 10 for non-fiction. This gave me the poke I needed to knuckle down and read it. So this weekend gone I did just that: it is a very easy read, for reasons I hope I can make clear. 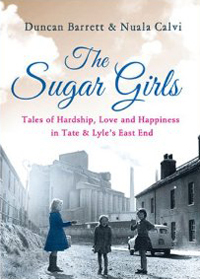 “Sugar Girls” is what eastenders and the girls themselves called the female factory workers at Tate & Lyle’s massive sugar refinery and syrup factory plants in Silvertown. The young ladies themselves were fiercely proud to be known as such. This book follows the stories of four of them – steadfast Ethel, gadabout Gladys, determined Lilian and tragic Joan (names you barely hear nowadays), their families, colleagues and bosses over an approximate 10 year period starting at the back end of World War II. Historians of the period tend to focus on austerity, rationing, the foundation of the NHS, nationalisation, and so on. In The Sugar Girls, these things are barely mentioned, if at all. Why? Because the book is a collective memoir of four women whose day-to-day priorities were getting to and from work, keeping their family together and securing and keeping a boyfriend or husband at a time when most men were returning from war or going on National Service. That is how these now elderly ladies remember the period. (Lovers of historical trivia will enjoy, as I did, the origin of Tate and Lyle’s sugarcube man). It would be so easy for the authors to have fallen into the trap of presenting the East End stereotype, but they succeed brilliantly in avoiding this. While our heroines do love a sing-song and a knees-up, these and similar phrases are never employed; nor can I recall a single example of Cockney rhyming slang. Nonetheless, there is no shortage of unsavoury and unpleasant characters in our story, and certainly the locals are hard nuts, evidenced by several rather brutal sugar girl fights and occasional bouts of domestic violence. Most people in this industrial part of town were dirt poor. But the massive Tate & Lyle had a reputation of paying well, and looking out for its workers’ welfare. Although unionised, there didn’t seem to be much friction between staff and management during the period. But terms of service and certain working conditions from our perspective today seem positively archaic. Perhaps we shouldn’t be too surprised that you could drink alcohol at the recreation club during lunch, but I was genuinely surprised that in certain departments, women workers were obliged to leave the company on getting married – pregnancy didn’t even enter into it (inevitably, though, pregnancy looms large in our story). Although the authors – or perhaps their subjects – have suppressed some of the more jagged edges of post-War, industrial East London, there is plenty of hardship and heartbreak in this story, believe me. But overall, they have emphasised the positive, the funny and the uplifting. Do have the tissues close at hand when you get to the final chapter for the wrap-up of this remarkable, warm-hearted story of our mothers’ and grandmothers’ generation. My only criticism of this book has nothing to to do with beautifully-told story, but is rather about production: Sugar Girls lacks photographs, even though there are plenty available if you go to the Sugar Girls website. I do hope some of these may be included in subsequent editions, but if you haven’t read it yet, I do recommend you check out the pictures before or during your reading of this wonderful book. The Sugar Girls (340 pp) by Duncan Barrett and Nuala Calvi is published in paperback by HarperCollins, 2012, and with a cover price of £6.99 although available for less.